Two practice questions (MCQ) on Newton’s laws of motion are given below with solution. Even though these are meant for AP Physics C aspirants, they should not be difficult for those who are preparing for AP Physics B Exam. The velocity of the iron block at the moment of hitting the nail is 6 ms–1. Net force driving the system = Weight of B = mg = 2×10 = 20 N.
a = Driving force /Total mass moved = 20/4 = 5 ms–2. 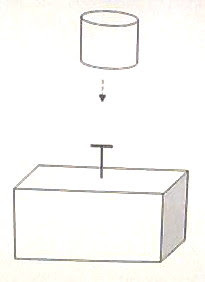 Tension, T = Weight of B moving down (as in a lift) = m(g – a) = 2(10 – 5) =10 N.
The negative sign shows that the iron block is retarded. The force exerted by the iron block on the nail is equal and opposite to that exerted by the nail on the iron block. The answer therefore is 7200 N.
The answer will be unchanged since the velocity at the moment of hitting the nail will be 6 ms–1 itself (v = √(2gh) = √(2×10×1.8) = √(36) = 6)].